If you're planning a trip to New York City, you won't want to miss visiting the historic New York Public Library, which features a number of attractions—Astor Hall, the Gutenberg Bible, the Rose Reading Room, and the McGraw Rotunda—which each carries a certain historical significance to this NYC staple. 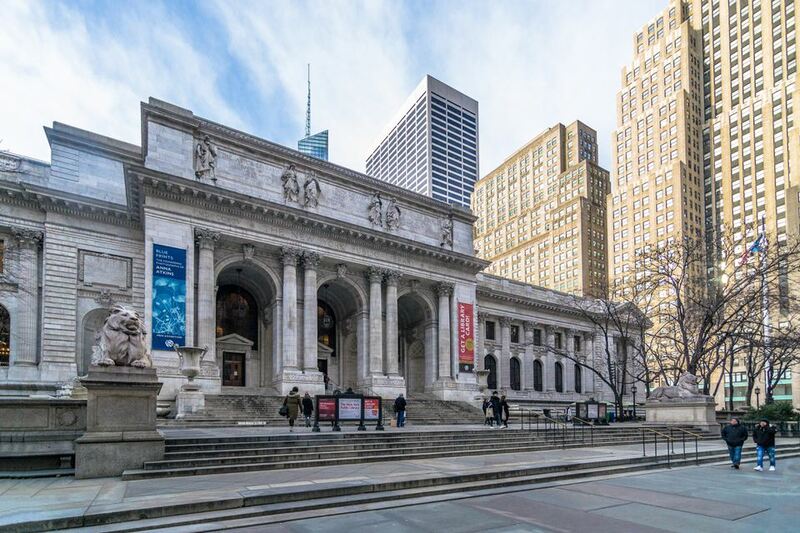 The New York Public Library was created in 1895 by combining the collections of the Astor and Lenox Libraries with a $2.4 million trust from Samuel J. Tilden that was given to, "establish and maintain a free library and reading room in the city of New York." Sixteen years later, on May 23, 1911, President William Howard Taft, along with New York Governor John Alden Dix and New York City Mayor William J. Gaynor, dedicated the Library and opened it to the public the next day. The site of the Croton Reservoir was chosen for the new library and its landmark design was conceived by Doctor John Shaw Billings, director of the New York Public Library. When the building opened, it was the largest marble building in the United States and home to over one million books. Exploring this great free attraction is relatively easy—all you need to do is register for a library card. You can then walk around the library on your own or head over to the information desk on the first floor to take one of two tours: The Building Tour or the Exhibition Tour. Each of these tours is entirely free and focuses on a different aspect of the library. The Building Tour is one hour and is the best way to take in the highlights of the building's Beaux-Arts architecture. The Exhibition Tour offers a chance to look inside the library's current exhibitions. Visitors today can conduct research, take a tour, attend numerous events, and even wander through the library to view its many treasures and artworks including the Gutenberg Bible, murals and paintings, and beautiful architecture that makes this location so unique. In addition to tours, there are regular events that take place at the library throughout the year. Check their website to see what is on the calendar during your visit. The building that most people think of as the New York Public Library is actually the Humanities and Social Sciences Library—one of five research libraries and 81 branch libraries that make up the New York Public Library system. The New York Public Library is located at 42nd Street and Fifth Avenue in Midtown East and takes up two blocks between 42nd and 40th streets. Subway access is available via the MTA 7, B, D, and F trains to the 42nd Street-Bryant Park Station. Admission is free, with the exception of some lectures that require advanced tickets to attend; for hours of operation, contact information, and details regarding tour times and special events visit the official website before planning your trip to the NY Public Library.